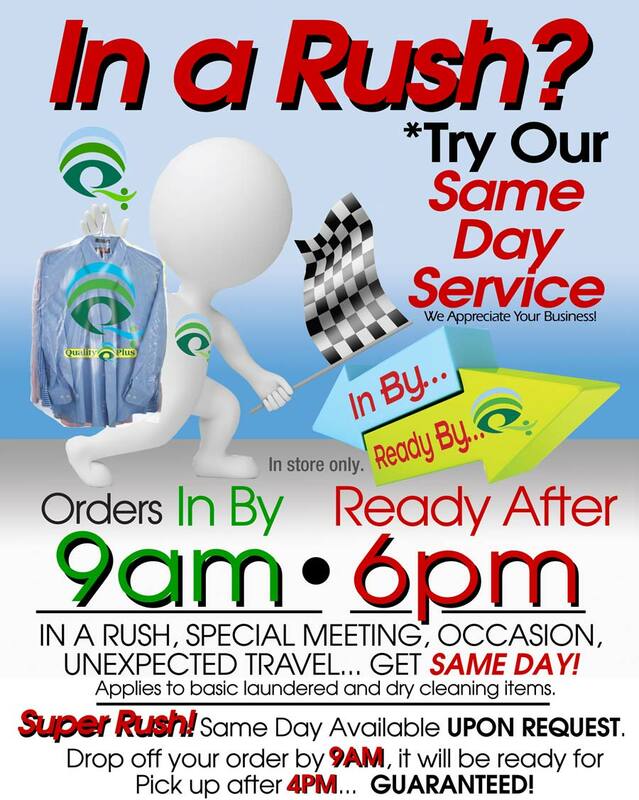 Try Our Same Day Service Dry Cleaning Orders In By Ready By 9am • 4pm Available at ALL Locations IN A RUSH, SPECIAL MEETING, OCCASION, UNEXPECTED TRAVEL or JUST FAST! Our In By... Ready By offers Same Day service when you need your order completed in a hurry. Drop off your order by 9AM, it will be ready for Pick up by 4PM Same Day. GUARANTEED! Applies to basic laundered and dry cleaning items. Excludes Bridal, Suede, Leathers, Rugs and Alterations. Ask your store representative for any other exclusions.